In this mode there are 3 kinds of the submenu. Do not adjust the User Setting while driving. You may lose your steering control and cause severe personal injury or accidents. 1. Stop the vehicle with the ignition switch in the ON position or engine running. 2. Press the ▲ or ▼ button until the User setting mode is displayed. 3. 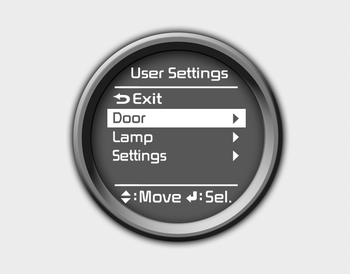 With the User setting mode displayed, press the button until the screen is changed. 4.You can change the item by pressing the ▲ or ▼ button and select an item by pressing the button. Key Out - All doors will be automatically unlocked when the ignition key is removed from ignition switch (or smart key is in the OFF position). If the headlamp delay function is checked : The Headlamp delay and Headlamp Welcome function will be activated. If the welcome light function is checked : The welcome light function of puddle lamp will activate. The lane change signals will blink 3 times when the turn signal lever is moved slightly. The driver's seat will automatically move forward or rearward for the driver to enter or exit the vehicle comfortably. The warning illuminates on the LCD display when the steering wheel is not aligned with the ENGINE STRAT/STOP button in the ON position. The shift indicator function will be activated. For more details, refer to “Manual transaxle shift indicator” in this chapter. Manual Reset - The average fuel economy will not reset automatically when you drive after refueling. You can reset the average fuel economy by pressing the button for more than 1 second when the average fuel economy is displayed. 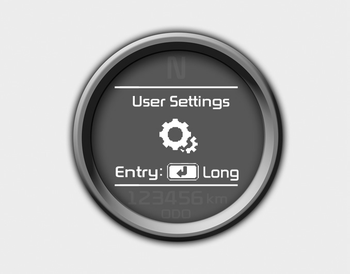 Choose the language you prefer within the LCD display.